The Blue Ridge Parkway Foundation works with many organizations in the community, ranging from civic groups and nonprofits to businesses, that volunteer their services and provide funding and expertise in support of our mission to preserve and enhance the scenic route. We are so grateful to collaborate with these groups that have joined our Community of Stewards. If you would like your organization to become involved, please contact Willa Mays or call (704) 267-1598. 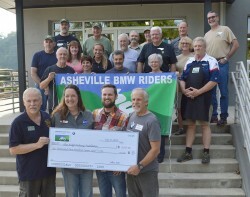 The Appalachian BMW Riders (formerly Asheville BMW Riders) host an annual event, the Blue Ridge High Pass Boogie, to support the Blue Ridge Parkway Foundation. This fundraiser has a route for every rider. Dual sport, pleasure, and endurance routes over majestic Appalachian high country and through hidden mountain valleys showcase world class terrain, sweepers, and twisties. Proceeds, minus basic expenses, are donated to the Foundation. For more information, visit the group's Facebook page. The Blowing Rock Charity Horse Show Foundation hosts an annual event to benefit the Blue Ridge Parkway Foundation and additional community groups. These funds ensure the preservation and maintenance of riding trails at Moses H. Cone Memorial Park, which are enjoyed by thousands of visitors every year. The Blue Cross and Blue Shield of North Carolina Foundation is a funding sponsor of the Foundation's signature Kids in Parks program, providing more than $2 million in grants since 2008 to launch and expand the TRACK Trail network across the state. An independent nonprofit, the BCBSNC Foundation is dedicated to improving the health and well-being of North Carolinians. The Blue Ridge Boxster Summit is an annual four-day event that invites Porsche owners to gather and drive the Blue Ridge Mountains. Proceeds from the event benefit the Blue Ridge Parkway Foundation and honor the late Chuck “Porsche Pete” Hammersmith. The Blue Ridge National Heritage Area (BRNHA) serves to protect, preserve, interpret, and develop the unique natural, historical, and cultural resources of 25 Western North Carolina counties and the Qualla Boundary (Cherokee) for the benefit of present and future generations. In doing so, BRNHA seeks to sustain our heritage and stimulate economic opportunity in the region. The staff and volunteers also have a significant role in providing visitor services at the new Blue Ridge Parkway Visitor Center, milepost 384, near Asheville. For more than 50 years, the Blue Ridge Parkway Association, a group of travel businesses and chambers of commerce, has provided information about accommodations and visitor services along the Parkway corridor. Its annual Blue Ridge Parkway Directory & Travel Planner is distributed for free at Parkway visitor centers and contains the most extensive single listing of hotels, attractions, and other travel services in the region. Butler + Burke provides business, nonprofit, and individual professional accounting services, and handles the Foundation's financial audit each year. Founded in 1923, the Carolina Mountain Club is the oldest hiking and trail maintenance club in Western North Carolina and fosters the enjoyment of the mountains and adjoining regions. The club maintains 400 miles of trail at the southern end of the Blue Ridge Parkway and builds new trails. The group collaborates with the U.S. National Forest Service, National Park Service, and State of North Carolina. Chetola Resort at Blowing Rock is an 87-acre resort within walking distance of a quaint mountain village, neighboring the 3,500-acre Moses H. Cone Memorial Park, and surrounded by the Blue Ridge Mountains of Western North Carolina. Since 2016, Chetola Resort has hosted The Denim Ball, a benefit event that raises funds to rehabilitate the Cone park. The Conservation Trust for North Carolina works directly with landowners, local land trusts, and government agencies to protect land and water resources most important to communities across North Carolina. Since 1996, one of the Trust’s most important goals is to work closely with the National Park Service to identify and save key properties that contribute to the scenic views and natural resources of the Blue Ridge Parkway. Chartered in 1948, Eastern National partners with 175 of the nation’s most significant cultural, historical, and recreational destinations, including the Blue Ridge Parkway, to provide products, programs, and publications in visitors centers and stores. The nonprofit donates the proceeds from every sale to partners working to enhance public lands. Since its founding, Eastern National has contributed more than $105 million in support of vital educational programs. FRIENDS of the Blue Ridge Parkway works with members, volunteers, partners and a network of Chapters to protect, promote and preserve the Blue Ridge Parkway and support the National Park Service. Based in Boone, North Carolina, Jonathan Burton Photography is an award-winning, full service studio, specializing in portraits, weddings, and fine art scenics. Each spring, Burton holds "Portraits on the Parkway," offering portrait sessions for ages 5 to 18 on the grounds of Moses H. Cone Memorial Park. The images are offered at a special rate with a portion of the proceeds benefitting the Blue Ridge Parkway Foundation. Mast General Stores offer a variety of goods from fashion to cookbooks and toffee to tents. Each September the Mast General Stores host Friends' Day, when multiple stores generously donate a percentage of sales to support the work of the Blue Ridge Parkway Foundation. For more than 80 years, the National Council for the Traditional Arts (NCTA) has produced and supported a variety of traditional arts programs in national parks across the country. NCTA helps fund musical programming at the Blue Ridge Music Center at milepost 213 on the Blue Ridge Parkway near Galax, Virginia. Programming at the Music Center, including the summer series of performances, is a program of the Blue Ridge Parkway Foundation. The National Park Service is a branch of the Department of the Interior and manages the Blue Ridge Parkway. Its mission is to preserve unimpaired the natural and cultural resources and values of the National Park System for the enjoyment, education, and inspiration of this and future generations. In 2016, the park service is celebrating 100 years. Learm more about the centennial anniversary. Ray's Weather provides detailed weather forecasts and information for Western North Carolina. In 20TK, the Blue Ridge Parkway Foundation and Ray's Weather collaborated to create www.BRPWeather.com, which provides weather information and webcams views along the Blue Ridge Parkway. Each year, Ray's donates proceeds from the sales of its Blue Ridge Parkway calendar to the Foundation.